With the small matter of the Premier League showdown against the worst team ever to win the Champions League, Chelsea, coming up over the weekend, there is an unusually large ocassion of a massive football game tonight, in the Milk, or Rumbelows, or Littlewoods, or Worthington, or Carling, or Capital One Cup tonight,(Seriously, what’s with those names?) with Coventry City, who may not really be setting Europe on fire with their football. In fact, I doubt they are even igniting fire flakes in League One, where they currently ply their trade. 23rd after 7 games, drawing 3 and losing 5 in the process. Yet, it is such ties that really make cup games so magical. Where reputations don’t count for anything, and it’s your performance on the night that counts. Relegated from the Championship, after finishing second from bottom, Coventry have had a downward spiral since being relegated from the Premier League in 2001. They have struggled over the course of 11 seasons in the Championship, in the midst of which they even oversaw a stadium move, from Highfield Road to the Ricoh Arena, in 2005, a year before Arsenal moved from Highbury to Emirates Stadium. Several close shaves with relegation finally ended in 2012, when they were finally relegated to the third tier of English football, after 48 seasons, winning only 9 of their 46 games. And as I said earlier, life in the third division has been far from rosy. Coming into a clash with one of the contenders in the Premier League, having lost 5 games on the bounce in League Two, is an ideal situation for the Gunners to set up a cricket score. That said, lower league opposition can never be taken lightly, as Leeds United proved yesterday, with a 2-1 win over Everton. Coventry do have some reasonably famous names. Captain Kevin Kilbane, who has won 110 caps with Republic of Ireland, has over 300 Premier League appearances to his name, for Sunderland, Everton, Wigan and Hull City, and funnily enough, more than any in the current Arsenal squad. Theo Walcott comes closest with 224. Other names who may (or may not) strike a bell are former Birmingham striker Gary McSheffrey, who made a mark early in his career, with Coventry itself, and young Reece Brown, a defender on loan from Manchester United, also the younger brother of Sunderland’s Wes Brown. Coventry also recently signed Conor Henderson on a short term loan, from us, and the midfielder could feature. 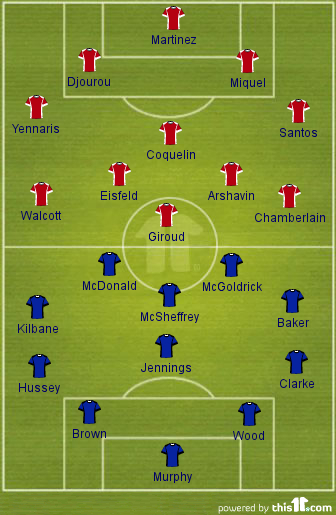 Arsenal, on the other hand, will field a good mix of experience and youth, with one eye on the weekend’s game. Named in the squad are the experienced heads like Andrei Arshavin, Johan Djourou, Andre Santos, Sebastien Squillaci, Marrouane Chamakh and Theo Walcott, who have found it hard to have any impact on the first team so far this season. Also named is Olivier Giroud, who may be relishing the prospect of facing today’s opponents, to score his first goal for the club. Among the youngsters named in the squad are first team contenders Francis Coquelin and Alex Oxlade-Chamberlain, among others who are pushing for first team spots, the likes of Thomas Eisfeld, Nico Yennaris and Ignasi Miquel. Serge Gnabry is a great hope for the future, I rate him highly,If he continues his development, I think he could play in the first team this season. At the moment he needs to work and ensure he remains fit.He is in the category of Oxlade-Chamberlain and Walcott – guys who have great power, great pace and good dribbling skills. He has goalscoring potential and good vision as well for the final ball. He can play centrally behind the striker or on the flanks. Also expected to be on the bench is Emmanuel Frimpong, who has been on the sidelines, for nearly 8 months out, since he suffered his second cruciate knee ligament injury, while on loan at Wolves. He could come on some time during the game. Thomas Eisfeld, signed from Borussia Dortmund this year, is also one who could make a start. He was impressive during pre-season. The midfielder, who plays in an attacking position, has had two injuries in the past, but has shown tremendous resolve to make a name for himself. Personally, I am looking forward to seeing the likes of Arshavin, Walcott, Santos, Coquelin and Giroud stepping up the plate and grabbing this opportunity to make inroads into the first team. Especially Andrei Arshavin. I have always been a big fan, and everyone is entitled to have a hard time. I think he still has plenty to offer to the team. And the manager certainly feels so. At the moment he’s a victim of the high level of competition that exists for places. He has a huge respect from everybody in the dressing room, and especially from the staff.I feel he’s unhappy that he doesn’t play because deeply he loves football and he practices every day with 100 per cent commitment. I’m happy to give him some competition on Wednesday night. Here is how I think the teams will lineup. Finally, a word for Nico Yennaris. Dreams do come true, and Yennaris has proved that. A little young boy, running on to the pitch with his idols, in a league clash with tonight’s opposition, almost 10 years back, he is in the squad tonight, and is expected to start at right-back. 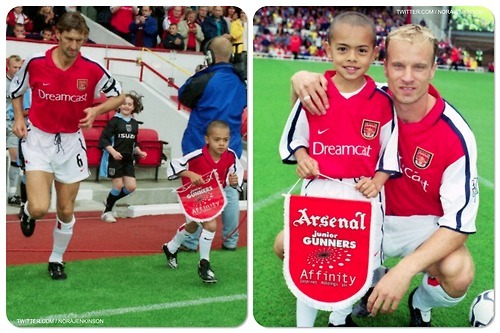 This double picture, where the then 8 year old, snapped up with club legends Tony Adams and Dennis Bergkamp, goes to show how far he has come. Enjoy the game wherever you are.